Modern, Light Filled Home Overlooking a Bubbling Stream Surrounded by Trees and the Mountains. Vaulted Great Room with Skylights and Loft Bedroom. Relax Out on the Deck in the Hammock While the Soothing Sound of the Water Lulls You Into a Meditative Bliss… when it Gets Chilly You Can Sit Inside by the Woodstove. 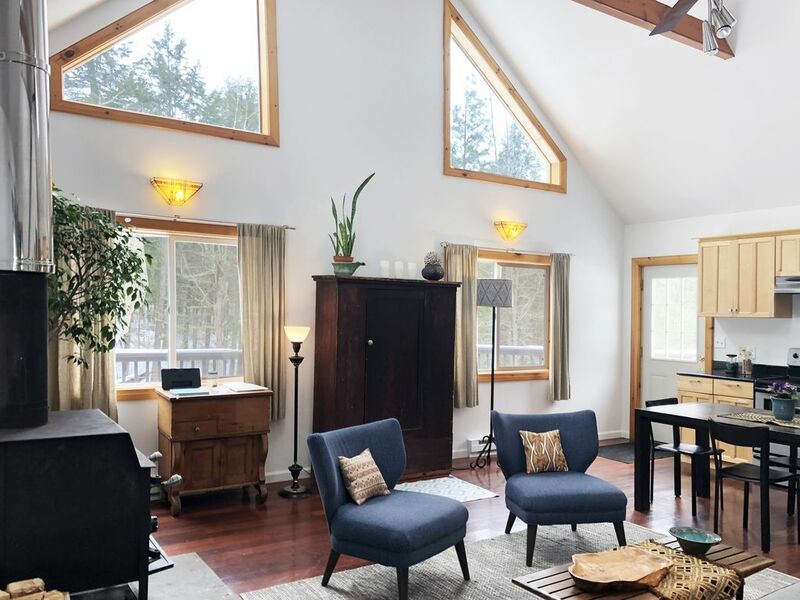 Located in Secluded Woodland Valley, Just Minutes to Downtown Phoenicia with Shopping, Galleries, Local Restaurants and Nearby Hiking, Fishing and Tubing. Minutes to Hunter Mountain and Bellayre. *Please note - this house is on a secluded private mountain road - 4 wheel drive is preferred for icy winter weather. We are both multi-tasking creative people working in NYC's Art and Design industries. We split our time between New York City and the Catskill Mountains. Traveling with our furry companions. This place is magical. We love it as it's a truly special spot and we are happy to share the beauty of it with others. It's wonderful to see how this space has become a place of recharge from the city, a warm gathering spot for friends, marriage proposals, a honeymoon getaway, a place of healing and retreat for the people who pass through. The sound of the stream. It's like you are living inside a meditation CD! Minimum age limit for renters 25. This place was very well stocked and really comfortable. The stream right below the deck was a calming sound even if the slushy snow prevented us from going down to it. Beds were comfortable and our 2 year old granddaughter set up her own sleeping place in the upstairs closet. Thanks for a great stay. Beautiful, serene spot in the Catskills. Off the beaten path of Phoenicia, while still being close enough to town to enjoy the Phoenicia Diner & Foxfire Mountain House. The house has everything the four of us needed, oh, and our puppy LOVED the experience. The hosts are wonderful and unobtrusive, they have everything under the control and are easily accessible. Alison's cabin was the perfect getaway for a short Christmas vacation. We made a last minute decision to go to the Catskills and was able to book seamlessly on short notice. We only have good things to say about Alison's place. Not only is the place so aesthetically pleasing, it is very functional, immaculately clean, and has every necessity you can think of. It was lightly snowing outside and all we wanted to do was stay in, watch movies, and play board games which we were able to do thanks to all the entertainment provided in the home. We also brought our two dogs Brooklyn and Bella and they had a blast! We loved having them meet Harmony, Alison's dog who is adorable and came out a couple times to say hi. We would absolutely return again. We are already talking about planning to come back in Spring. We would 100% recommend her place! Lovely cabin and wonderful host! Beautiful property tucked away in Phoenicia. We really enjoyed our stay, and the host Alison was incredibly helpful and responsive. A quaint, very clean home snuggled along a relaxing babbling brook. A beautiful place for a relaxing getaway weekend. Lovely place to stay in the Catskills! A beautiful cabin in Phoenicia. There is a stream right next to the house, the sound is so soothing. Very clean and comfortable. A serene retreat. Ski: Belleayre mountain is a 20 minute drive, Hunter Mountain is a 40 minute drive.